In recent days I’ve grown increasingly tired of what I would call the Standard Cafe Lineup. Turkey pesto, chipotle chicken, caprese, tuna salad. Maybe a ham and cheese or some manner of roast beef. All of those sandwiches can be delicious, even stupendous, but by definition the average turkey pesto you encounter is unlikely to be spectacular. It would be all too easy to get hung up on this, to grouse at length about atrophied imaginations and stunted vision. But there’s no need for that, because with a little extra effort you can find places like Fundamental LA, places that are taking atypical ingredients, combining them in interesting ways, and putting out stellar sandwiches. In the case of the above it’s duck confit, cooked up to a wonderfully crispy, chewy state. That’s joined with chimichurri, pickled watermelon radish, butter lettuce and garlic aioli on a brioche roll. That’s a delightful lineup, and it all works together spectacularly well. 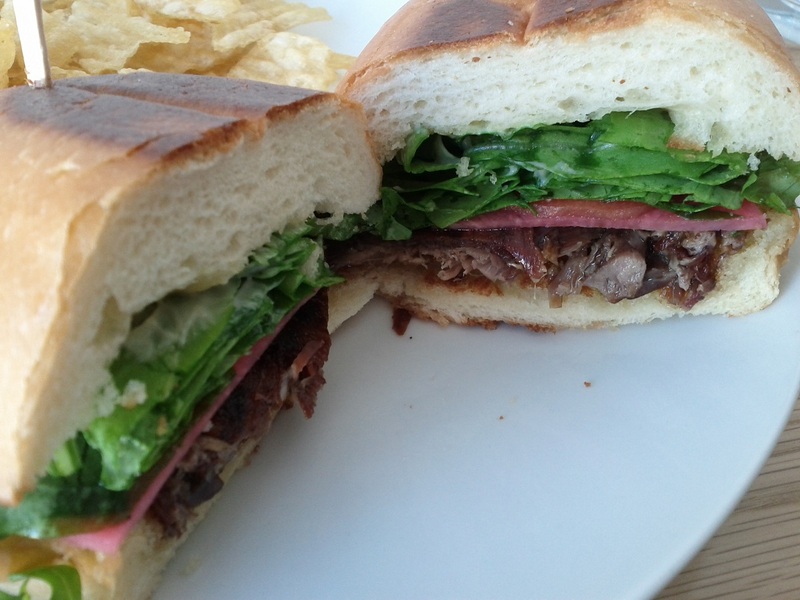 The sandwich is bright and flavorful, with acidic notes from the radish and the duck cradling all other flavors in its savory depth. Brioche is an underutilized sandwich bread, and this sandwich is a good example of why it’s so useful. It’s a soft and yielding bread, meaning none of the ingredients slide anywhere, and you just get the sweet starch notes that are so essential to what we know as a sandwich. Little Chef Counter in San Jose made use of similar breads, to similarly successful ends. This was a fine sandwich. A sandwich as good in execution as it is in conception is a rare thing indeed, and I was delighted to have this one.